May 19, 2010 - Fort Lauderdale - Spirit pilots are helping Spirit passengers prepare for a possible pilot strike should Spirit management refuse to return to the bargaining table to secure a new contract for Spirit pilots through billboards in Fort Lauderdale, Atlantic City, and Detroit. This week, the Air Line Pilots Association, Int’l placed billboards in Spirit Airline’s three major airport hubs alerting them to the serious labor dispute at Spirit and requesting that passengers confirm their reservations with the airline before flying. “Any strike has the potential to disrupt plans,” said Capt. Sean Creed, leader of the Spirit unit of ALPA. “We do not want to strike, but if we do, we want our customers to be aware of what may be coming, and to make their plans accordingly.” After three years of fruitless contract negotiations, on May 12, Spirit pilots and management entered into a 30-day cooling-off period, which ends at 12:01 a.m., June 12. At that time, either side can engage in “self-help” and the pilots may withdraw their services and lawfully strike. 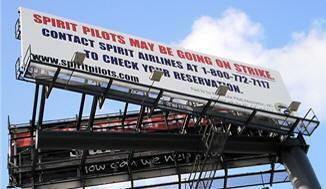 The pilots marked the occasion by staging informational picketing directly outside Spirit company headquarters. Joined by pilots from AirTran, American Eagle, Continental, Delta, Pinnacle, and United, nearly 100 pilots marched to demonstrate their unity and their resolve to get a fair and equitable contract for the Spirit pilots. In spite of being profitable for the last six reported quarters and expanding the company’s routes, Spirit management continues to ask for concessions in work rules and benefits from a pilot group that is already operating under a below-industry-standard contract. The pilots will stage additional picketing events and rallies throughout the 30-day cooling-off period. On Wednesday, May 19, the pilots will picket at Detroit Metropolitan Wayne Airport out front of the North Terminal. Please make plans to come out and show your support. Founded in 1931, ALPA is the world’s largest pilot union, representing nearly 53,000 pilots at 38 airlines in the United States and Canada.